Won't we just get more 'crap cycle lanes'? We've all seen Warrington Cycle Campaign’s Facility of the Month site9 and many of us have bought the book10, but just because we’ve all seen and laughed at rubbish infrastructure, it doesn’t mean we shouldn’t be pressing for well-designed cycle facilities instead. Let’s not throw the baby out with the bathwater. The fact is that rubbish cycle lanes will get built whether we campaign for them or not, because the guidance that is out there is too weak and often ignored. Rather than give up all hope of getting decent bike lanes and learning to survive out there on the roads, we think that there should be national minimum standards for cycle facilities which will prevent any more of those cycle lanes that run into the sides of bus stops or demand "cyclists dismount" every 50 yards. We’ll be working to develop those guidelines and to promote best practice nationally and locally. 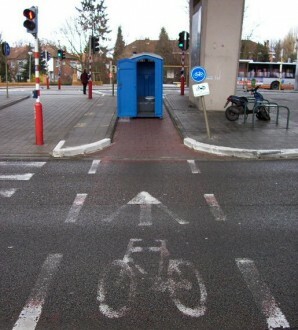 It will be a sad day for lovers of cycle-related humour when the last ‘crap cycle lane’ passes into history, but a good day for everyone else. So why don't we get more? But don’t you need get more people cycling first before you can press for better facilities? At the moment, cycling is such a minority activity no politician would dare champion it.